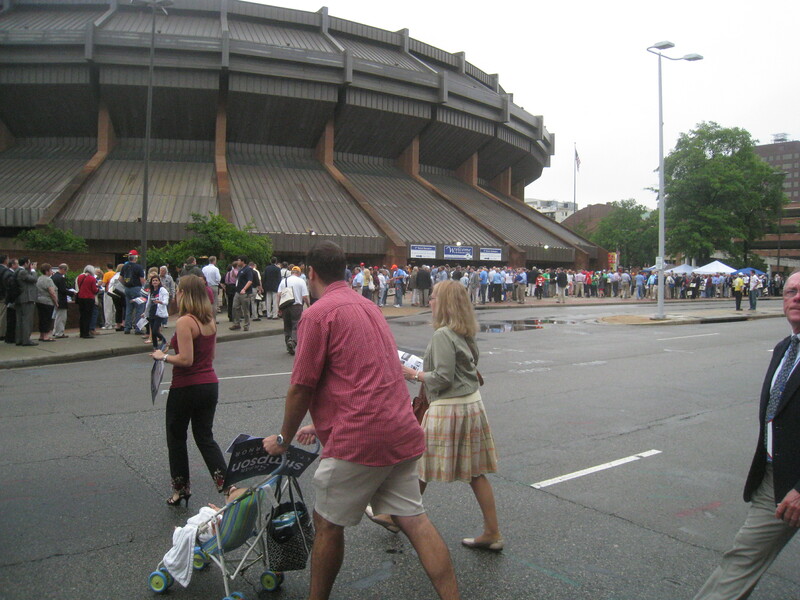 One extremely frustrating aspect of Saturday’s Virginia Republican Convention (which I cover in considerable detail in a previous article) was the excessive amount of waiting. Typically, there is a good bit of down time, a good bit of wasted time filled with an array of speakers that do little to alleviate the boredom of the crowd. Unfortunately, the 2013 Convention offered attendees countless hours with little to do. Between the technical difficulties associated with counting the first round ballots, coupled with the daunting prospect of another three rounds of balloting, it was inevitable that a bit of mischief would occur sooner or later. After all, even a fervently Republican crowd could only stomach so many lackluster speakers or repeated Cuccinelli campaign commercials. 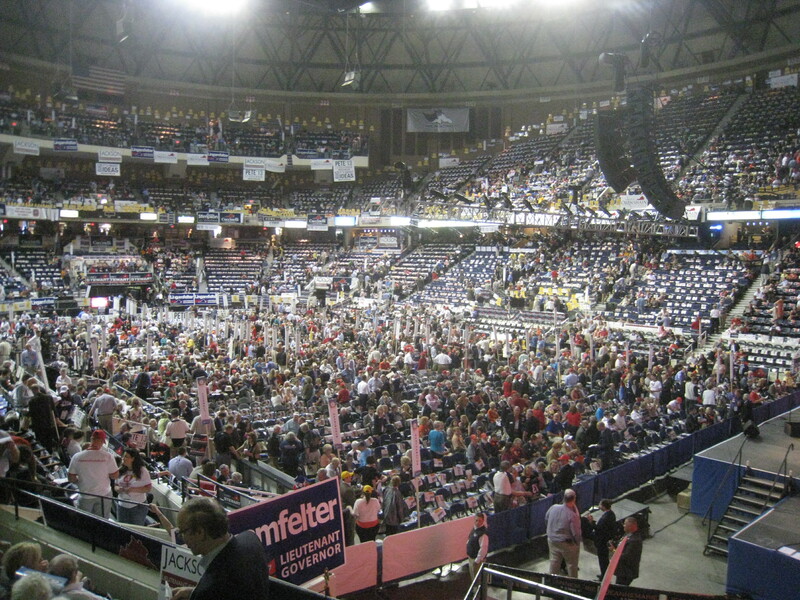 At one point, in order to amuse themselves, a few of the delegates in the upper reaches of the Richmond Coliseum began to make and throw paper airplanes. This new development seemed to greatly upset Pat Mullins, chairman of the state party, who took to the stage and in a gruff voice shouted for an end to the paper airplanes, stating that that these projectiles could damage the three $50,000 screens behind him. However, perhaps given the chairman’s demeanor, unconvinced that these planes could cause much harm to anything or anyone, or simply irritated by the continued waiting, the paper began to fly from the rafters again a short while later. For those of us seated on or around the floor, we simply watched as the handful of airplanes glided and fluttered to the ground. 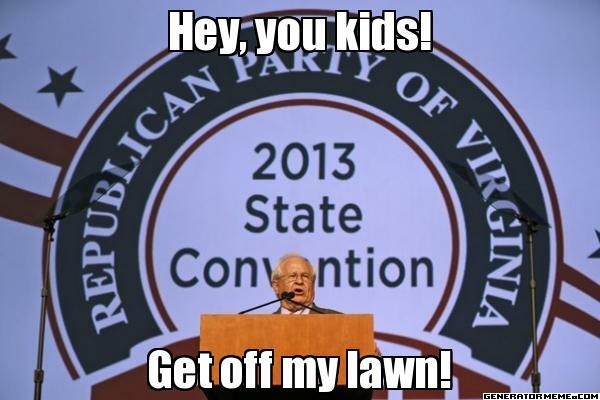 To poke a bit of fun at the whole situation, especially given that Chairman Mullins’ words seemed to fit the stereotypical angry old man motif exceedingly well, I couldn’t help but imagining him uttering these words while I was at the convention. Enjoy a little humor for your Wednesday afternoon! Shortly before 7 AM, a multitude of local Republicans gathered outside of the Harrisonburg GOP headquarters to depart for the 2013 state convention in Richmond. The Obenshain campaign organized this gathering. I led one of the two buses of 49 other activists. We left around 7:15 with the second bus stopping in Staunton to pick up additional supporters. About two hours later we arrived outside the Coliseum. The scene that greeted us was daunting. On both the left and right sides of the entrance, long lines stretched seemingly forever. Outside, most of the campaigns had a table underneath a tent handing out materials. The one exception was the Davis campaign which merely had a yard sign where one would expect to find her people. This development did not bode well for the Davis campaign, which I had previously assumed would survive at least to the second ballot. In addition, there were a fair number of protesters in pink shirts from Planned Parenthood deriding the candidacy of Ken Cuccinelli. Inside of the building each of the campaigns had an additional informational table, as did a multitude of other organizations such as The Leadership Institute, Middle Resolution PAC, and others. In the auditorium itself, each delegate was grouped according to the city or county from which he or she came. This year, the placement of each locality depended upon the percentage of their delegates who paid the voluntary $35 fee. This change resulted in Harrisonburg city holding the choicest spot on the convention floor, front and center. Delegates from Rockingham and Augusta Counties, regions whose delegates also strongly supported Senator Mark Obenshain, flanked Harrisonburg. After many lengthy speeches from Louisiana Governor Bobby Jindal, Ken Cuccinelli, and the various candidates running for the Republican nomination, voting could begin. Although announced ahead of time, it was interesting that neither Virginia Governor Bob McDonnell nor Lieutenant Governor Bill Bolling attended Saturday’s convention. As an additional note, former Representative Allen West spoke on behalf of Delegate Scott Lingamfelter and Ollie North encouraged delegates to support Pete Snyder. Voting on the first ballot began about 1 PM or so, but the results were not announced until almost four hours later due to either technical difficulties or a recount requested by the Snyder campaign if the rumors circulating were true. Although the official tallies were not released due to Delegate Rob Bell’s request to withdraw his candidacy, Senator Mark Obenshain became the official nominee for attorney general. On the race for lieutenant governor, E.W. Jackson captured an early lead, winning 3,732 votes, about twice as many votes as his closest rival, Susan Stimpson. Corey Stewart finished third, followed by Pete Snyder, Scott Lingamfelter, Jeannemarie Davis, and finally Steve Martin. As no candidate received a majority of the votes, Martin and Davis were eliminated and delegates voted again. Unfortunately, the official numbers for the first ballot were not announced until after many delegates had already cast their second ballot, which likely skewed the next results as we were erroneously led to believe that Stewart placed second instead of Stimpson. Behind the scenes, the Davis campaign encouraged her supporters to rally behind Jackson. About two hours later, voting from the second ballot was announced. Jackson increased his totals to 4,558.38, while Snyder jumped to second with 2066.89. Stewart finished third while Stimpson and Lingamfelter, with the two lowest totals, were eliminated. 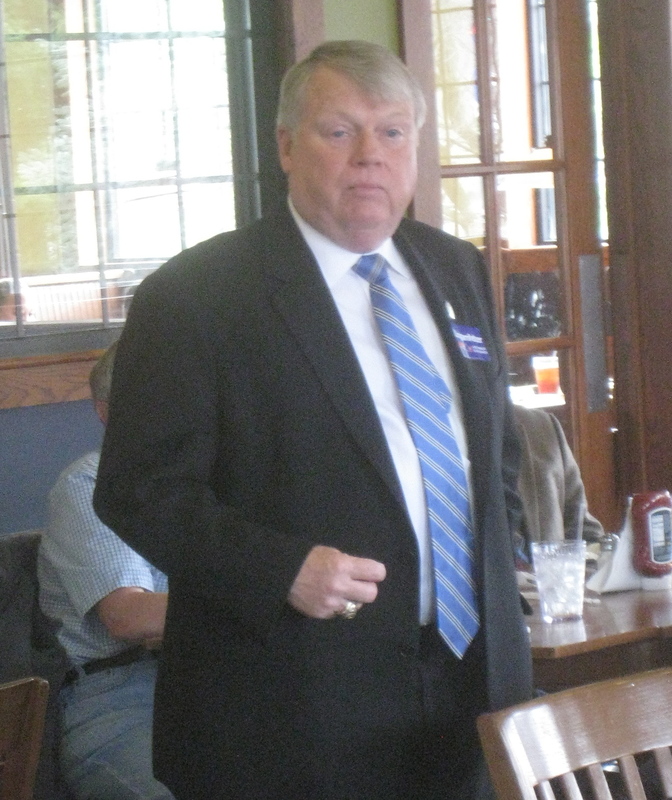 Lingamfelter cast his favor to Snyder while the Stimpson campaign did not recommend any particular candidate. The results for the third ballot came one hour and forty-five minutes later. Jackson’s vote total again expanded to 5,934.69 with Snyder second with 3,652.97. At this point, E.W. Jackson had over 49% of the vote and thus his election on the next ballot was a virtual lock. 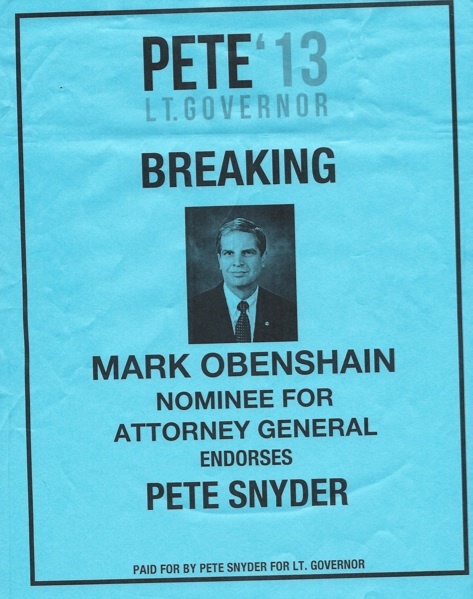 The Snyder campaign passed out fliers declaring that Corey Stewart had endorsed Snyder as had Mark Obenshain. The latter revelation came as a complete shock given that Obenshain had remained silent in this race up until now, coupled with the fact that such an endorsement would be particularly foolhardy given that Jackson’s victory was all but a certainty. I spoke with both Chris Leavitt, Obenshain’s campaign manager, as well as Suzanne Obenshain, his wife, who denied any endorsement. In addition, Corey Stewart appeared and walked around the floor with Jackson with raised hands. It was terribly unfortunate that in a desperate bid to win the Snyder campaign would resort to such dirty and dishonest tactics, ploys that were all too common in the closing days of the campaign. Update: Bearing Drift reports the following regarding the actions of the Stewart campaign. A little after 10 PM, Pete Snyder withdrew his candidacy and thus E.W. Jackson was declared the victor. With voting finally concluded, we returned to the bus and headed back west to our home across the mountain. On a personal note, unlike many of the delegates, as I did not have a favorite candidate, I ended voting for three different LG candidates over the course of the day. I intended to cast my final vote for Pete, but, after his campaign spread their misinformation, I couldn’t reward deception and thus proudly cast my vote for E.W. Jackson. All in all, it was an exciting and tiring day that went much longer than needed. However, it was filled with a bunch of surprises and uncertainty, regrettably marred by technical difficulties, a bit of misinformation, and a splash of deceit. Given that the state central committee has selected a convention in 2014 to choose the Republican candidate for Senate, we’ll do it all again next year. Hope to see you then! VC Note: Most likely along with a multitude of other tea party members, I received the following message from Middle Resolution PAC. As the title states, I find the line “if he loses then we lose” particularly intriguing. Given the numerous complaints against Corey Stewart currently circulating on the internet, I’d hate to peg my fortunes on his performance tomorrow. So will the tea party rally behind Mr. Stewart? Will this support scatter? Or will it concentrate on another of the seven LG candidates? I guess we’ll see. The last 2 weeks have been difficult on us all as we have been in the throes of a political mudslinging match aimed at our candidate, Corey Stewart, the perceived front runner in this race. I want to make a plea to everyone not to get distracted by the smoke and mirrors of a political primary but to focus on the candidate whom we’ve selected to represent grassroots conservatives in VA. If he loses then we lose and we must do everything we can to help him win the nomination on Saturday. The attacks on Corey’s campaign ethics are based on hearsay and innuendo with no proof that he is in any way involved with unethical behavior. While Corey is the focus of these attacks the whole delegate list has been receiving e-mails from John Gray, a former democratic opponent of Corey’s, attacking Corey’s record. How did John Gray get the delegate list? Recently 2 pieces of direct mail were sent from “Checks and Balances for Economic Growth” attacking Corey Stewart calling him “King Corey!” So clearly they also have the delegate mailing list and clearly there are a number of dirty hands in all of this yet the bloggers and Breitbart are focusing on Corey. Why is Breitbart so concerned about a 7 way LG primary race? The Breitbart articles by Michael Patrick Leahy, seem to be very concerned about possible ethics violations by Stewart, but ignore many of the same actions by other candidates. Is he interested in the shadow group doing direct mail pieces against Stewart? Nope, just Stewart! Notice that Grover Norquist endorsed the pledge that Corey signed. Why is he criticizing Corey for signing and adhering to the pledge that his group constructed? Throughout this process Corey has been forthcoming with us and has met or talked to every tea party with concerns about the attacks on his record (in one instance to his detriment). The whole purpose of the vetting process was to unite conservatives behind a candidate and help that candidate win against a well funded, data rich, progressive democrat candidate. Corey prevailed in a thorough vetting process that looked at campaign strength, ability to fund raise, and knowledge of free market principles. We were not the only ones who vetted these LG candidates, John Tate head of Campaign for Liberty and Morton Blackwell of the Leadership Institute did their own vetting and came to the same conclusion that we did; Corey Stewart is the candidate best suited to defeat the democrat in November. Corey’s record cutting regulations, cutting spending, and fighting illegal immigration is consistent with tea party principles. He is no stranger to the tea party, he attended one of the first CoLA meetings to help create a state immigration policy that would mirror what he has done in PWC. He also sought tea party support for a bill to eliminate the corporate income tax and he continues to keep an open line of communication with tea party activists. Corey’s accomplishments in Prince William County are a model for our state government. While spending in VA has grown by 66% Corey has cut $143 million in spending from the county budget and per capita spending is below what it was in 1992. While little has been done to address the challenges of illegal immigration at the state level Corey has implemented policies to enforce immigration law and has reduced crime. While we just received the biggest tax increase in VA history to supposedly fund transportation, Prince William County funded a $300 million dollar transportation project without raising taxes. If we want to solve the transportation issue we should call on other counties to maintain their own roads and decentralize road building and maintenance from VDOT to the localities. Lastly, while Medicaid spending has increased by 1500% in the last 30 years, Corey’s most recent budget proposed 9.6 million in cuts to social services. This is the type of leadership that we need in VA and I hope you will all rally behind Corey on Saturday and push him across the finish line. VC Note: I wrote the following piece back on March 22nd of this year. For the last several months, I have debated whether or not I should post it; after all, I don’t enjoy writing negative articles against candidates. However, given recent high profile endorsements, including the virtual tea party endorsement, along with a slew of anonymous hit pieces tied directly or indirectly with the Stewart campaign, I realized that this issue must be highlighted and not done in secret on behalf of someone else, but through my own hand. There are two facets to Corey Stewart and his campaign that, in my mind, set him and his campaign apart from the other six in this race to be Virginia’s next lieutenant governor. The first is that his campaign is the only one of the seven to speak with me about working for him. In all fairness, I’m a bit surprised by this development. Although I’ve discussed this issue with the Cuccinelli campaign and both the Bell and Obenshain camps, I’ve taken a rather neutral approach to the LG race. 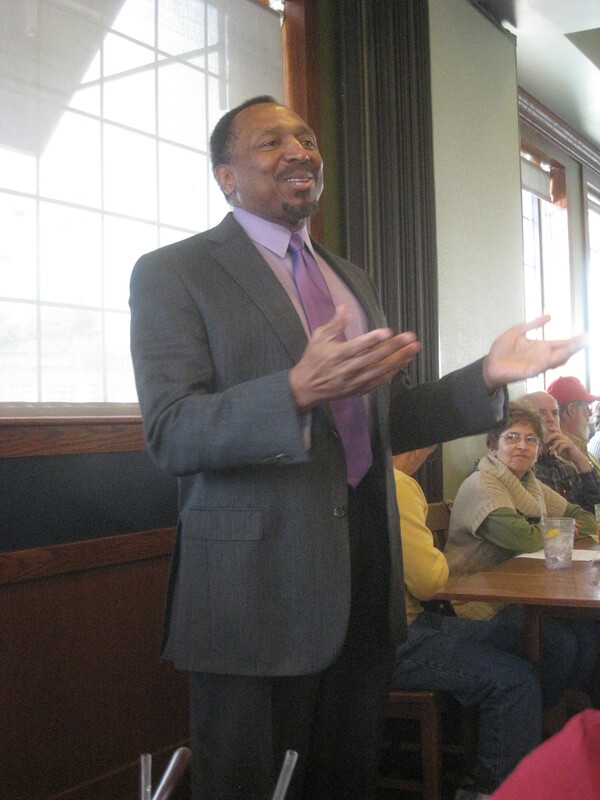 Nevertheless, while attending a dinner with Mr. Stewart, his staff, and fellow members of the tea party in Harrisonburg late last year, I was told that the Stewart campaign was looking to hire someone with Ron Paul connections to work within the liberty community. Given that I served as the director of grassroots organizing in South Carolina for Dr. Paul in 2007/08, appointed myself the unofficial Harrisonburg coordinator for the 2012 campaign, and have been quite active with my fellow brothers and sisters in liberty over the years, I suppose that I would fit the bill pretty well. In addition, at that time I was (and unfortunately still am) searching for political employment. And yet, despite the chance to make a steady paycheck and work amongst my Ron Paul brethren once more, I did not jump at this opportunity. But why? This question leads me to the second issue. Rewind the clock to late 2010 and early 2011. Before Corey Stewart began his listening tour, gauging the idea of running for U.S. Senate, I didn’t know too much about him. Sure, he was and is the Chairman of the Board of Supervisors for Prince William County; cracking down on illegal immigration was his signature issue that brought him a lot of praise and condemnation from various folks, but those details covered the extent of my knowledge. 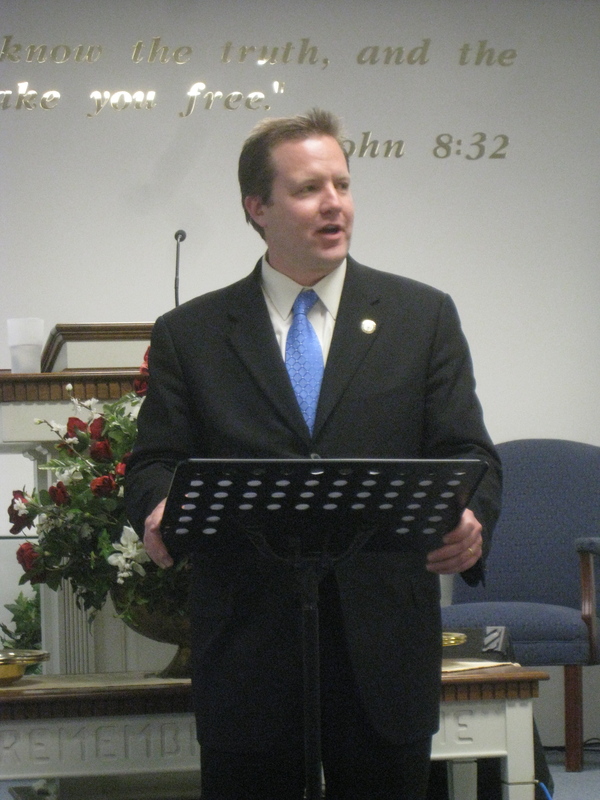 However, on February 24th of 2011, Corey Stewart came to speak to the Harrisonburg Tea Party. Looking back further, as I wrote back in October of 2010, a new Facebook group popped up called “Republicans Against a George Allen Comeback”. At that time, I didn’t pay the group much mind. After all, like many Virginia Republicans, I still wore the rose-colored Allen glasses. In my mind, George Allen was a great governor and a pretty good senator who ended up saying some stupid things which cost him his position back in 2006. In addition, I should add that I almost always develop a very strong sense of loyalty to my former employers; even though I didn’t work for him directly, in 2006 I was an employee of the Republican Party of Virginia whose top priority was Allen’s re-election. I found that the more I learned of Corey Stewart on the night of 2/24/11, the more I liked him. Therefore, when he repeated some of the same claims offered by the previously mentioned Facebook group, I decided to look into the matter. Was George Allen, as Mr. Stewart suggested, a “mediocre” senator? (video from VA Social Conservative). Did he support many of the same big government programs that tarnished the Republican brand in Washington, programs for which I previously condemned Republican president George W. Bush? Upon Mr. Stewart’s urging, I set aside my previous thoughts about George Allen and looked at his record objectively. And what did I find? The sobering truth. As many readers already know, unfortunately George Allen was one of those Republicans who vastly expanded the role of the federal government in areas such as education, health care, and the erosion of our civil liberties. For me, the facade that I had wishfully erected around George Allen since my first days in politics had been shattered. I was convinced that Virginia conservatives could and should nominate someone far better than Mr. Allen to send to the U.S. Senate. By November 1st of 2011, Corey Stewart decided against running for the Republican nomination for U.S. Senate. So then, he must have rallied behind one of the candidates, like Jamie Radtke, right? No, in a stunning complete reversal, he endorsed George Allen. According to Politifact, “Stewart was asked about his characterization of Allen as a ‘mediocre’ senator. ‘All in all, I’ve got to say that I retract that statement and I have to say he had a very good senate record,’ he said.” But wait just a second. As he was no longer in office, George Allen’s Senate record did not change. The only thing that did change was Corey Stewart’s political motivations. I was (and still am two and a half years later) shocked by this development. How could Mr. Stewart tour Virginia for the purpose of deriding George Allen to endorse him only nine months later? Obviously, the answer, as Corey Stewart states in the Politifact article, stems, not from desire to spread the truth, but from his political ambitions. Is this quality of flexible morality something you desire of someone who seeks to lead us in Richmond? Given these factors, I’m sure you can understand why I didn’t pounce upon the opportunity to work on the Stewart campaign last year. Yes, I’m sure that they would have compensated me fairly well, but what price would I have to pay? If I promoted his message to my fellow liberty-minded activists would I completely destroy my credibility in the movement? If I knowingly worked for someone who I didn’t trust from the very beginning could I bear the sight of looking at myself in the mirror? Now, I know that some would merely shrug their shoulders at this idea. After all, a job is just a job. But I firmly believe what you do (and what you do not do) is an important reflection of who you are. Many people value my writing on this blog for its objectivity, which I appreciate. However, I must state my strong opinion that although Mr. Stewart might be a fine candidate and person in many regards, I can only support candidates I can trust. Therefore, I could not work for Corey Stewart nor will I be able to cast my vote for him at the Republican convention on May 18th. The last thing either the Republican Party or Virginia needs to promote is another self-serving politician willing to say or do anything to advance his or her own political career. Should the Stewart campaign wish to offer a rebuttal to this piece, I’ll be happy to offer their commentary to you. As we count down to the 2013 Virginia Republican Convention, campaigns, PACs, and special interest groups flood the mail with countless colorful pieces urging delegates to support their favored candidates or oppose others. Today, I received what I think is a particularly peculiar mailer from Virginians for Limited Government (VLG). The front of the mailing bemoans the rise of state spending by 66% over the last ten years. Although there is little doubt that increased spending in the Commonwealth is a cause for concern, when pondering this statistic one should consider the rise in tax revenue and state spending as a result of population growth. For example, in the last two years alone, according to the Census Bureau, Virginia has seen a growth rate of 2.3%, considerably higher than the national average of 1.7%. Yes, I believe that the increase in state spending is a problem, but simply looking at that number without parameters isn’t particularly helpful. However, what really got my attention was the back of the mailer. First, it lauds Corey Stewart for his role in decreasing spending in Prince William County, which is an issue that ought to be considered. However, it goes on to condemn Steve Martin, Jeanmarie Davis [sic], and Scott Lingamfelter. Now, you might ask, why does the mailer do so? Did these three sponsor massive spending bills? It doesn’t make this claim. Well, do these three have a pattern of voting to increase state spending? The piece doesn’t argue this idea either. So then, what is the great fiscal sin of these three candidates? Well, as you can read for yourself, “all three were members of the General Assembly when state budget increased by 66% in the last decade”. With all due respect to Virginians for Limited Government (a great name and concept in my opinion), this mailer is nothing more that a load of crap. According to their logic, should we condemn all members of the General Assembly who have served for the last ten years? Is presumptive Republican gubernatorial and former State Senator Ken Cuccinelli likewise worthy of blame? How about attorney general candidates State Senator Mark Obenshain or Delegate Rob Bell? Give me a break! Like Virginians for Limited Government, I too support the idea of curtailing the state budget. However, the mailing they sent today is pure garbage. If you want a candidate with state government experience, then you should support State Senator Steve Martin, former State Senator Jeannemarie Davis, or Delegate Scott Lingamfelter. If you want a candidate from local government, then either Chairman Corey Stewart or Chairman Susan Stimpson is your choice. If you prefer a candidate who has not held office, a supposed “conservative outsider” as Virginians for Limited Government’s piece suggests, then Pete Snyder or E.W. Jackson is your man. 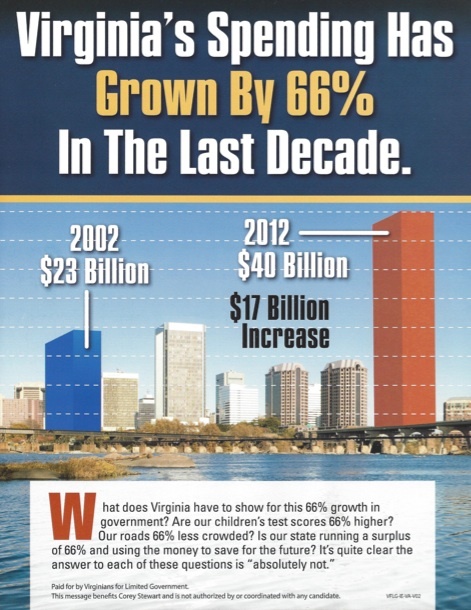 This mailer also begs the question of what is Virginians for Limited Government? Their website offers few clues as there is no contact phone number or email listed. Their Facebook page has not been touched since January 20th of this year and their Twitter account is likewise inactive, currently followed by no one. I called Americans for Limited Government to see if they were somehow connected, but was told that Americans for Limited Government has no knowledge of this group. Considering the lack of information, one does have to wonder if this organization is merely another shell designed to aid or hinder specific candidates in the 2013 convention. Given all of the misinformation floating around, I’ll be glad when the Republican convention is over. My advice to you remains the same; stay wary my friends, do you own research, and discover for yourself which candidate best represents your values. On Friday and Saturday, a number of tea party leaders from across the state met alongside officials from the Middle Resolution PAC to examine the nine Republican candidates for lieutenant governor and attorney general. The purpose in doing so was to evaluate each and determine which of the choices best represent the tea party values. Now, I first heard about this process in early February and, after reading all of the materials provided on the subject, came out in opposition to the idea. It was not an easy decision to make, especially given that the Virginia Tea Party Federation was in favor of it and that I worked for We rVirginia in 2012, a group funded by Middle Resolution. Nevertheless, I believed that it was the right thing to do. I crafted a couple of similarly worded emails stating my objections which I sent to the leadership of the Shenandoah Valley Tea Party and Middle Resolution. I’m been thinking a bit more about this vetting on the candidates to produce a “tea party” candidate for both lt. gov. and attorney general and must say that the more I consider this path, the more that I am opposed to it. Now I understand fully why this plan is being implemented. After all, we saw what happened last year. With everyone divided, arguably the least conservative candidate (George Allen) won the GOP Senate nomination. But is this proposal of rallying most or all of the tea parties in the state behind a candidate the best? In an ideal situation, I’d like to see the tea parties clearly state their principles for these races as well as inform their membership of the positions of each candidate. Based upon this information, we would let each person decide who best adheres to his or her principles. Instead, it seems that we are charting…a very top down/authoritarian course of action where the leadership and a handful of people in Richmond decide for the members who they think is best. Now being involved in politics for more than half my life, I know how these sorts of things work. Unfortunately, most people of all political persuasions act like sheep and will dutifully follow their leaders where ever they are taken. But, I’d like to think that the tea party is something different, something better than just “the leaders have spoken and the faithful membership will follow us without question”. I have a lot of respect for…[the people involved in the vetting process]… and the leaders of the various tea parties, but that respect alone does not mean that I can allow them to do all of my thinking for me. I suppose the question becomes, what do we do if we do not agree with the outcome of the vetting process? Are we beholden to honor it? I don’t mean to sound like a stick in the mud, but regardless of the outcome, I still plan to support whichever of the candidates that I deem is the best and will encourage everyone I know to learn about his or her choices and decide which person best fits his or her ideology. Another factor to consider is the members who have already pledged themselves to a candidate. Once a decision is reached will they reject their previous volunteer efforts and accept an outcome handed down from on high? Or is it more likely that they will resent what is done and go their own way, thus ultimately weakening the tea party? Perhaps I’m misunderstanding what plans are moving forth statewide, but, until I am convinced otherwise, I would recommend that the Shenandoah Valley Tea Party have no hand in this vetting process. There are too many parties, too many interests, and too many candidates involved. I believe that this plan strips away our political freewill, and without the freedom of choice, are we any better than either the Republicans or Democrats, whose flawed principles and processes led to the formation of the tea party in the first place? I know that unfortunately this letter goes against the plans of my former employers, but is my reasoning wrong? Do the ends of ideally nominating a better candidate justify the means of potentially subverting the desires of the individual tea parties and their members? Am I crazy to think that this plan is dangerous? Is the idea of molding politically self-aware tea party members that can arrive at their own decisions without mandates from above nothing more than foolish idealism? Besides the concerns listed above, I worried that this vetting would be seen as an endorsement and that it was quite possible that the process would nominate a candidate who didn’t actually adhere to the core values of the tea party. Nevertheless, I was assured that this process would not be called an official endorsement. At the end of the day, based partially upon the recommendation of a former tea party leader, I chose not to participate in this process myself. After all, if I did so and did not agree with the outcome, then would I still have any room to object? And, after hearing the results, I must say that I do strongly object. For the record, Corey Stewart won for lieutenant governor and Mark Obenshain for attorney general. First, some groups like the Lynchburg Tea Party have declared this outcome to be an outright endorsement, which is what I feared would happen. 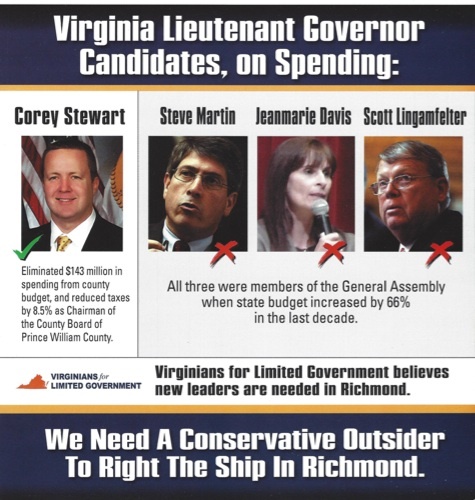 Second, from everything that I’ve learned about him, much like Black Velvet Bruce Li, I am not convinced that Corey Stewart is a proper banner carrier for the tea party principles of constitutionally limited government, fiscal responsibility, and a few other important issues that may come up in a future piece. Third, if the tea parties do feel compelled to stand behind a candidate, let them do so regionally, not statewide. Let Mechanicsville decide what is best for Mechanicsville, Montross determine what is best for Montross, and the Shenandoah Valley declare what is best for the Shenandoah Valley. Fourth, my worries that the vetting actually damaged the public perception of the tea party have increased after reading a number of recent blog posts on other sites. 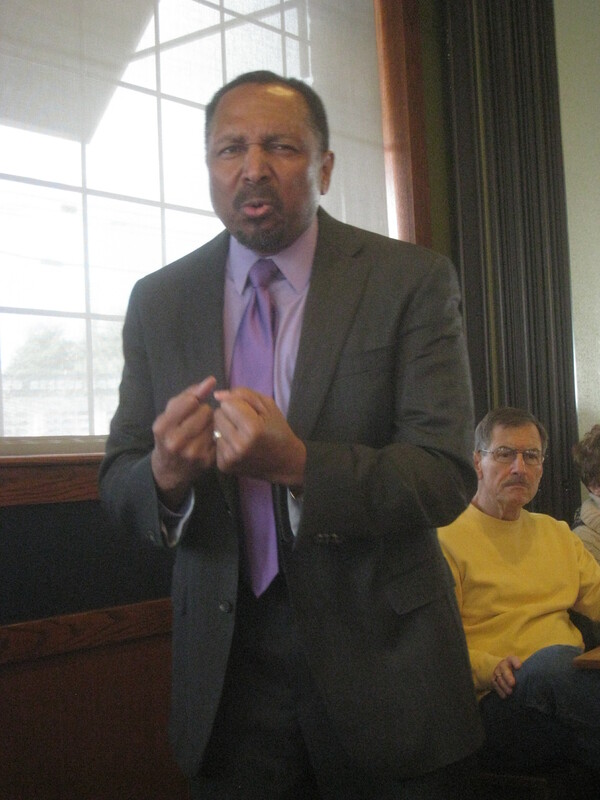 I am well aware that my comments may not be popular with many tea party groups, possibly even my own in Harrisonburg. Nevertheless, as a member of the Board of Directors for the Shenandoah Valley Tea Party, based upon everything that I’ve written thus far, I feel compelled to urge my fellow tea partiers to consider the results of this weekend’s tea party vetting process with extreme caution. If you are planning to cast your vote at the Republican Convention on May 18th, do so intelligently. I’ll tell you right now that I’m supporting my state senator, Mark Obenshain, for attorney general. However, you shouldn’t merely take my word as the absolute truth or the results of this tea party vetting either. If you think Rob Bell is more in line with your thinking, then you ought to cast your vote for him. You can use any endorsement as a guide, but never make that one item your only determining factor. Otherwise you surrender your vote to the whims of another. I know it takes time, but let me stress that you need to research the candidates yourself and decide which best represents your values and your principles. Last night, the Republican Women of Harrisonburg and Rockingham County hosted the seven campaigns for lieutenant governor. Jeannemarie Davis, Senator Steve Martin, and a rather hoarse sounding Corey Stewart each attended the event while Suzanne Curran spoke on behalf of E. W. Jackson and Scott Lingamfelter and Pete Snyder sent a member of their staff. Although I didn’t see anyone that I knew from the Susan Stimpson campaign, I assumed that one of her staffers or surrogates was in the audience. Getting back to Susan Stimpson, at the Lingamfelter meet and greet in Harrisonburg earlier that day, I had heard that she had to cancel her evening appearance at the last minute. However, I figured that someone would speak for her that night. 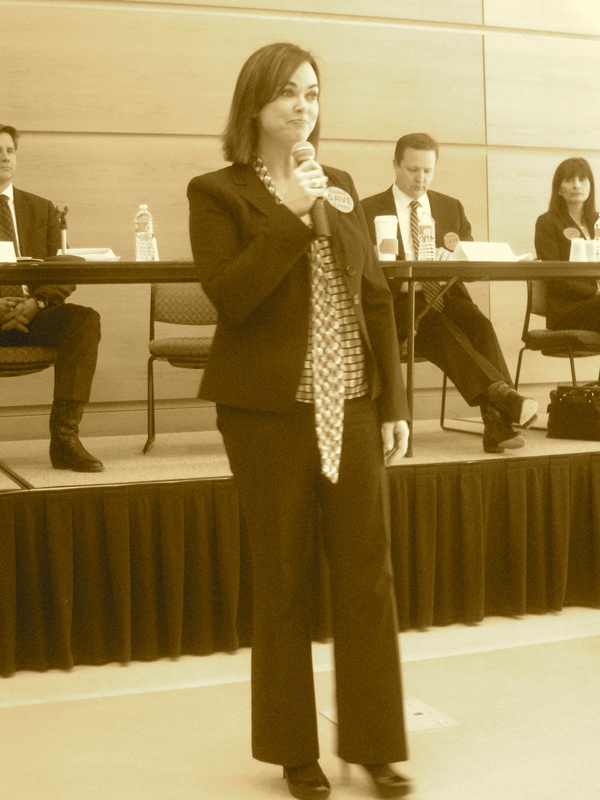 Unfortunately, I arrived to the Republican Women meeting a few minutes late, during the speech of Jeannemarie Davis. Once all of the candidates gave their presentation and I didn’t hear anyone from the Stimpson campaign, I simply guessed that her representative must have spoken first, before I arrived. Only just this afternoon did I discover that her campaign was a no show. Although I would recommend attending every event possible, especially the Republican Women, it is understandable that things do come up. Regardless, it is natural that some of the local women would feel slighted by an abrupt cancellation. Now, taken as an isolated incident, this oversight by the Stimpson campaign would be rather trivial. However, it seems to be indicative of trend for the Stimpson campaign; last night marks their third absence in several months at previously scheduled campaign events in the central Shenandoah Valley. Let me tell you that I’m not the only one around here who is starting to wonder. Where is Susan Stimpson? At 11:30 AM today, Delegate Scott Lingamfelter (R-31) came to Harrisonburg to speak about his campaign for lieutenant governor. Later in the evening, the Republican Women of Harrisonburg and Rockingham County held an event featuring each of the seven Republican candidates. However, as Delegate Lingamfelter was unable to attend this gathering in person, he decided to meet with the local delegates beforehand. Prior to Delegate Lingamfelter’s speech, two Valley legislators offered their thoughts and praise for him, Delegate Tony Wilt (R-26) and Delegate Steve Landes (R-25). Both men have previously endorsed his candidacy. Expecting a similar message to his last trip to Harrisonburg, I did not record Delegate Lingamfelter’s words. However, he offered a bit of a different message, focusing upon the proper role of government and ways in which he can make an impact as lieutenant governor to promote his philosophy. He stressed that one should never abandon his or her principles for the sake of political power. During the question and answer period that followed, I asked Scott Lingamfelter about one of my greatest reservations, his harsh condemnation of Ron Paul and his supporters after Paul’s unfortunate and ill-timed comments made after the death of a U.S. soldier. Presumably quite a few Paul supporters would appreciate a good bit of the Delegate’s record and rhetoric if not for his anti-Paul rebuke. Lingamfelter admitted that some of his words were written out of the anger stemming from the moment, given his personal experience dealing with the death of fellow soldiers and praised Paul for raising awareness for important issues such as auditing the Federal Reserve. As he pointed out from his campaign card, Delegate Lingamfelter has been advocating an audit of the state government. He also added that his greatest regret arising from that situation included his statement made against Senator Rand Paul, given Paul’s impressive effort to curtail the power of the federal government over the domestic drone issue. Lastly, I briefly spoke with Delegate Lingamfelter’s campaign staff regarding American’s for Growth and Prosperity [sic], the group responsible for anti-Lingamfelter attack pieces. Although I have no objection to criticizing the record of any candidate, I do not approve of a person or campaign that attacks a person anonymously. Such a move is not only questionable from a legal standpoint, but also reeks of cowardice. A word of advice to the other six candidates: if your campaign is behind this action, I urge you to admit it and come forward now. Yes, point out your objections to Delegate Lingamfelter, but do so openly. I doubt many undecided delegates, myself included, would look upon your campaign favorably should ties be unearthed between your candidacy and this anti-Lingamfelter front group. Getting back to my main point, Delegate Lingamfelter seems have build up a considerable statewide following, though his previous statements immensely weakened his chance of capturing any segment of the pro-liberty/Paul delegates. Will today’s comments in Harrisonburg help erase these misgivings? Is more required? Or is the damage simply irreversible? We’ll find out in about a month, once the 2013 RPV Convention delegates select their nominee.